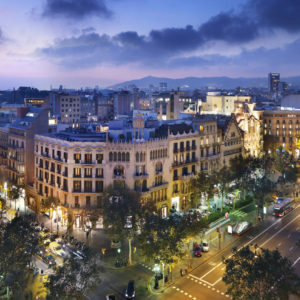 The capital of Catalonia is one of the most cosmopolitan and modern cities of Spain. 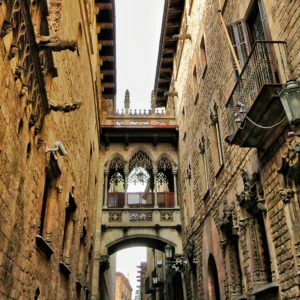 The best way to get to know it is to visit its most emblematic streets, those that reflect all its history, art, charm and personality. 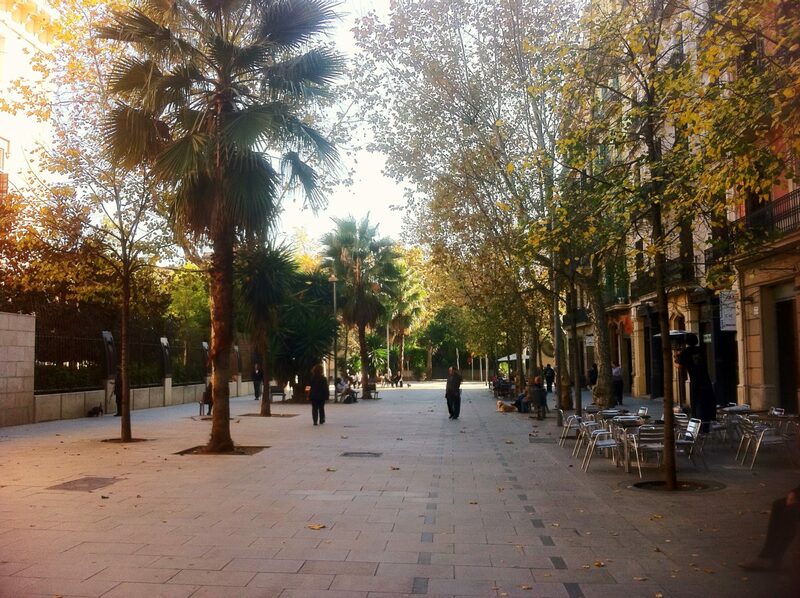 With RVD Media Group you can take a walk through them, looking for the next location for your audiovisual project. 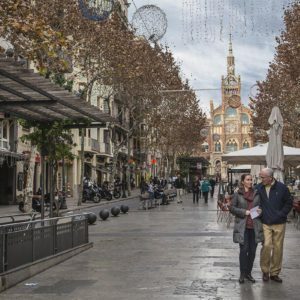 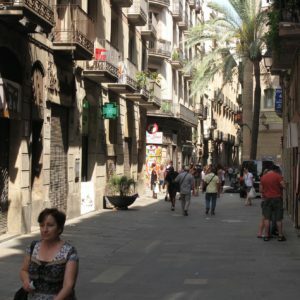 The streets have witnessed the evolution of the city and for one or the other, depending on the neighborhood to which they belonged, the different social classes of Barcelona have passed. 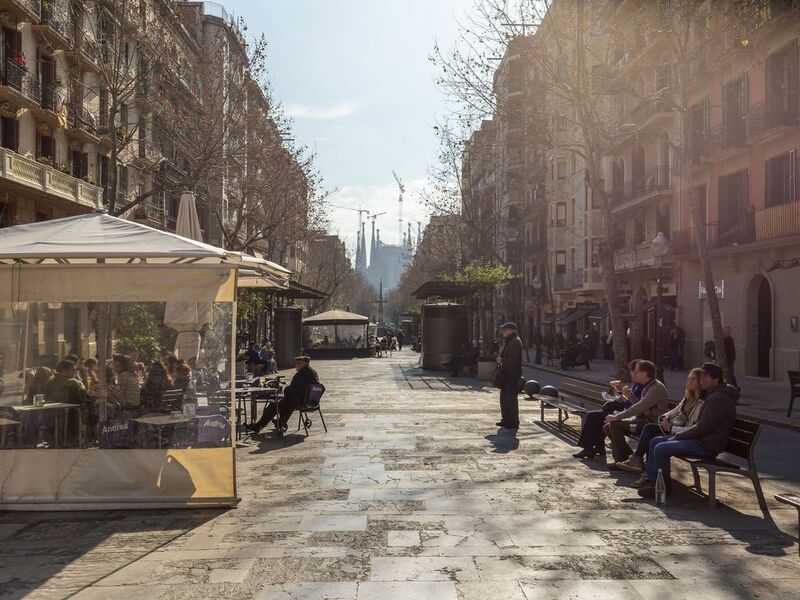 In Barcelona there are a lot of streets that, without being particularly famous, are charming spaces and worth seeing, even only crossing them on the way to another part of the city. 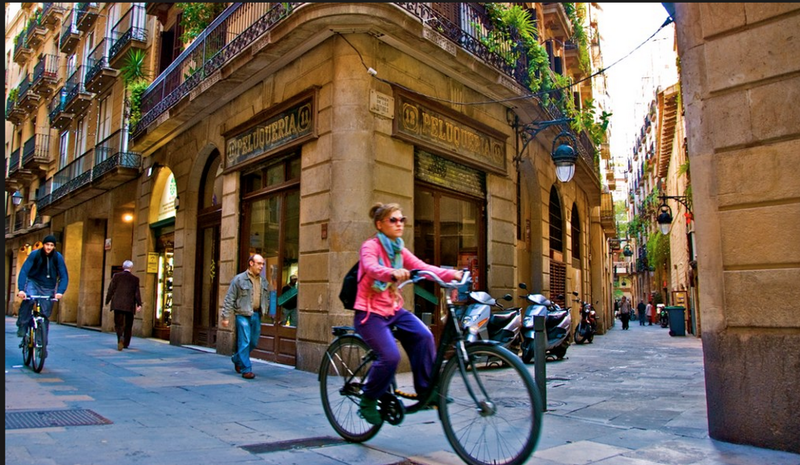 Why shouldn’t we start our tour through some of the most beautiful streets of the city of Barcelona? 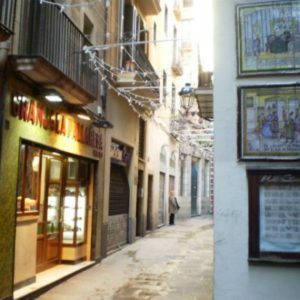 The street par excellence of Barcelona, the most photographed, which has starred in countless films, advertisements and multitudinous acts. 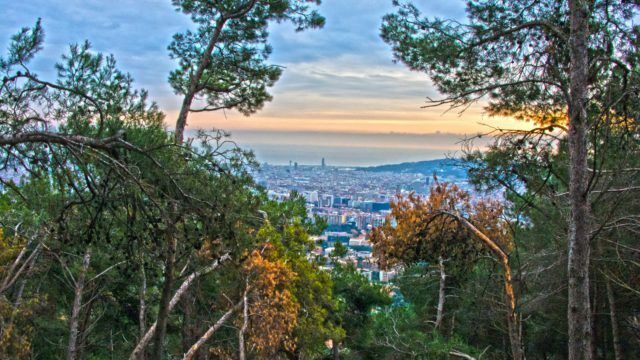 Besides being one of the busiest, a stroll among the trees stays easily on the retina of those who walk through it looking for the sea. 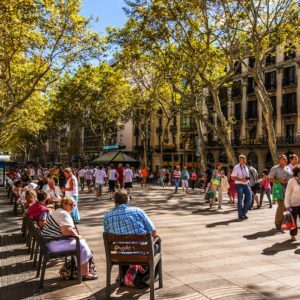 The emblematic avenue of Las Ramblas starts at Plaza Catalunya and runs to Plaza Colón, to touch the sea. 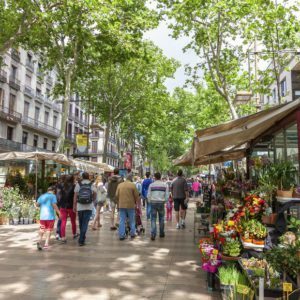 It is one of the liveliest, always full of people who go through it to find shops, restaurants, bars, ice cream parlors, flower stalls, souvenirs and much more. 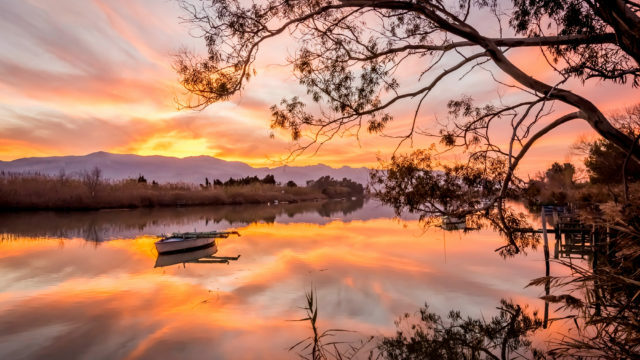 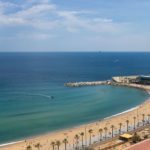 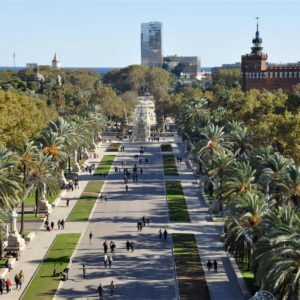 It has an original, diverse, alternative and funny atmosphere, but you will there also find places of great interest, such as the Boquería market, the Liceu, the Güell Palace or the Mirador de Colón. 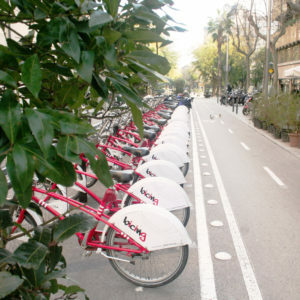 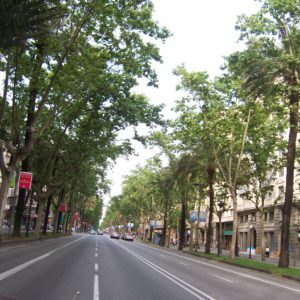 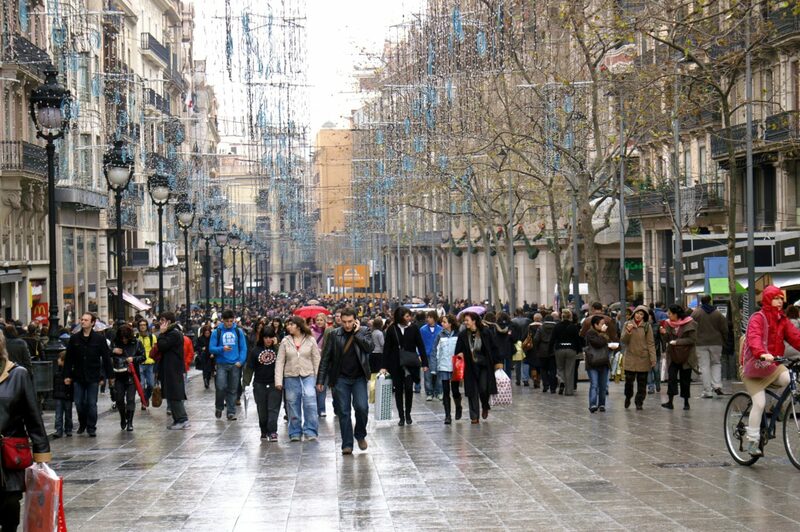 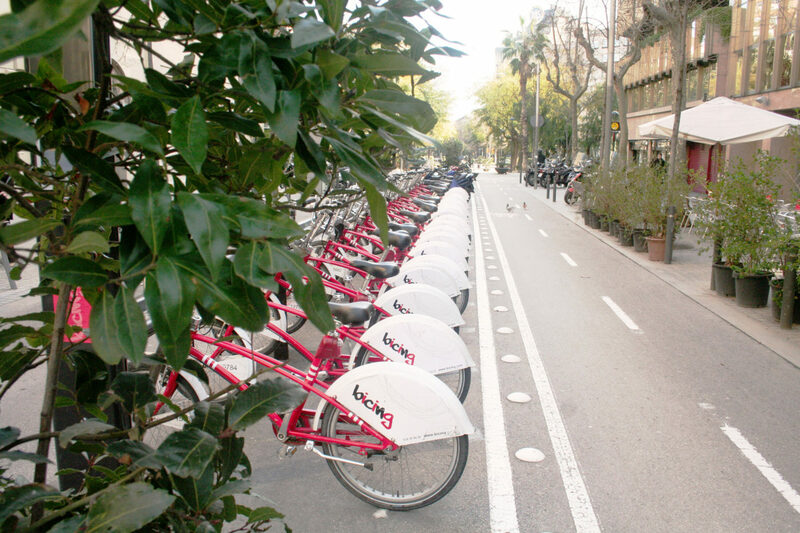 The central street of the Eixample is another of the most emblematic routes of Barcelona. 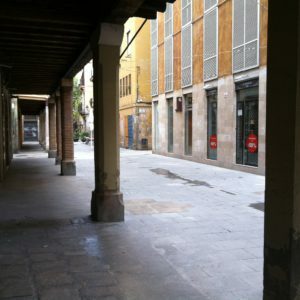 A particular showcase of the modernist architecture of the city, with many shops, more expensive as you move away from the centre and the tourists. 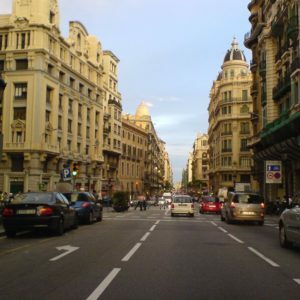 It is among the three most expensive streets in Spain. 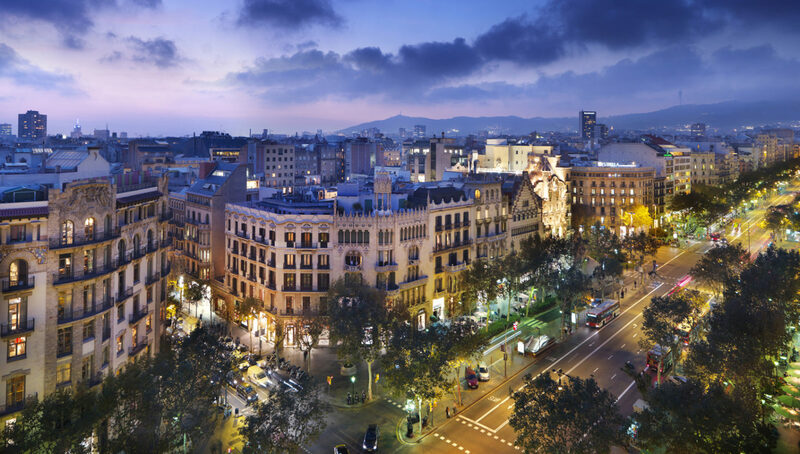 Buildings of architects like Gaudí, who left his marks in La Pedrera or Casa Batlló; Puig i Cadafalch, with the house Amatller, or Domènech i Montaner, with the house Lleó Morera. 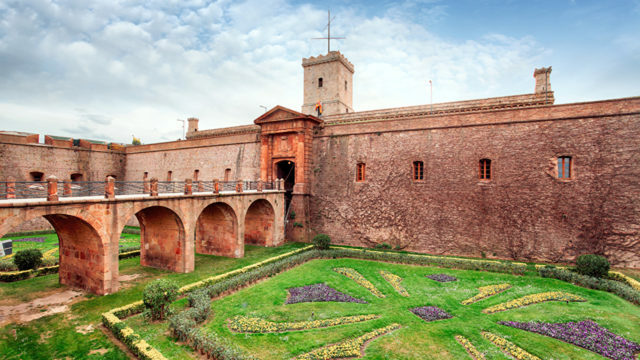 Here you will find a chic and stately atmosphere for your next audiovisual production or more urban photographic shooting. 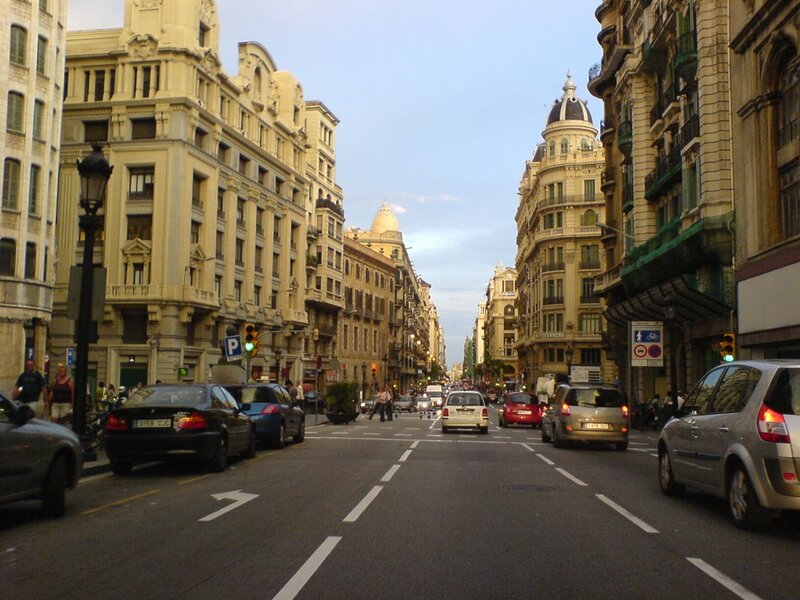 Via Laietana was built at the beginning of the 20th century, inspired by the architecture of the Chicago school. 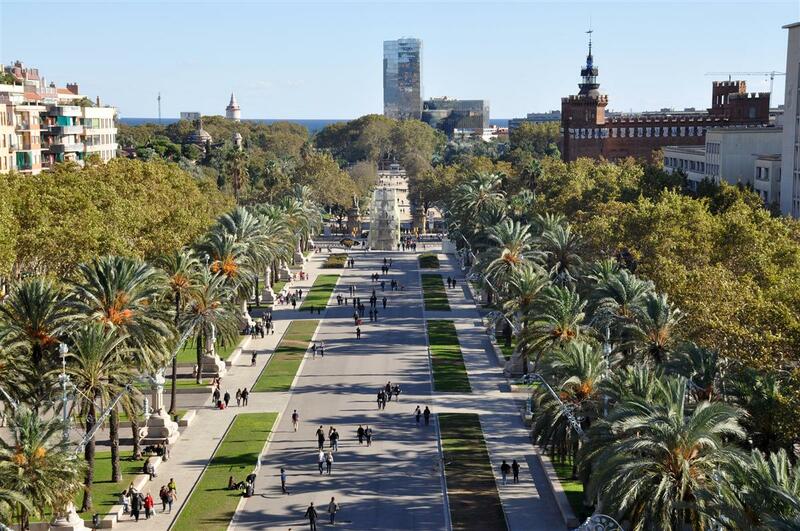 It begins at Plaza Urquinaona and runs until Plaza Antonio López, which is close to the sea. 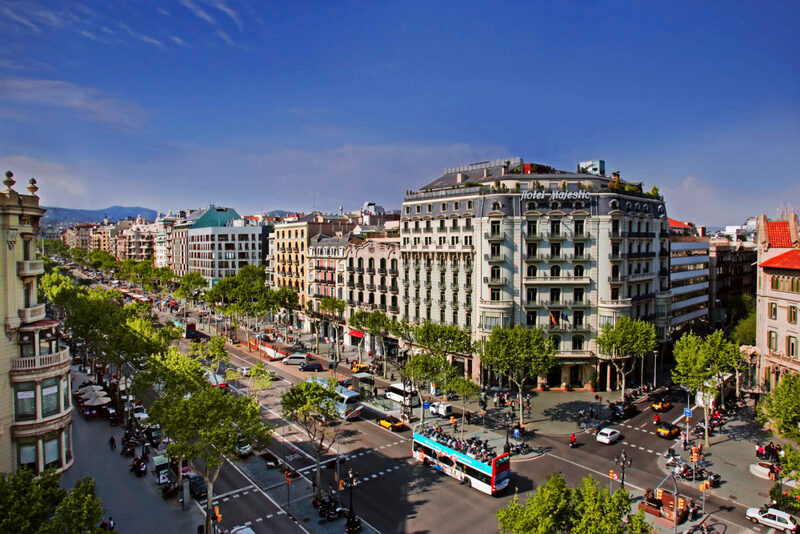 It is very visited for its modernist, art nouveau and art deco buildings that are located along the street and in its surroundings. 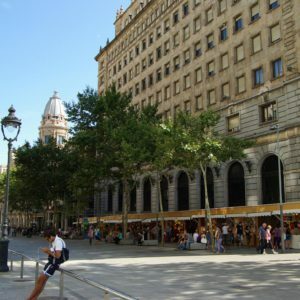 In addition, it demarcates the Gothic quarter, with the Cathedral and Plaça Sant Jaume, of the modern district of El Born and its market of Santa Caterina or the Cathedral of the Sea. 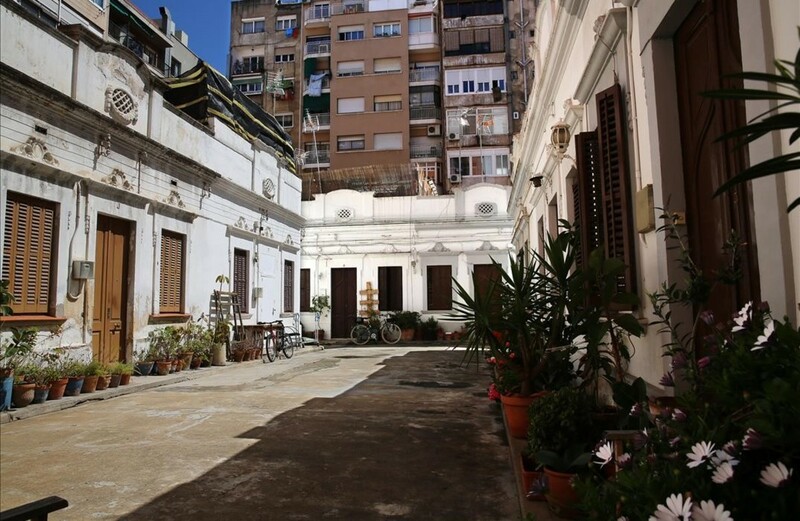 Among many other locations it is an ideal place for the audiovisual project you have in mind. 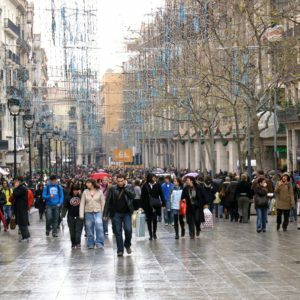 Portal del Ángel is a pedestrian street located in the heart of Barcelona. 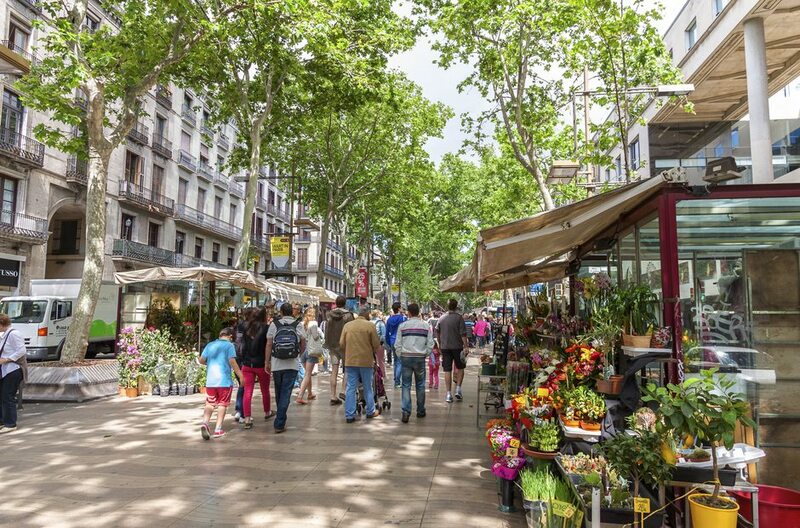 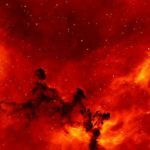 Its great commercial activity makes it one of the most important economic axes, in which you can find all kinds of shops. 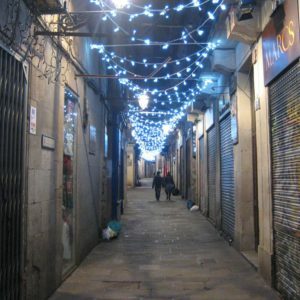 It is common to find there traveling artists who dance, or perform various shows on the street. 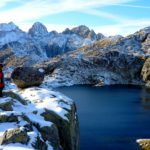 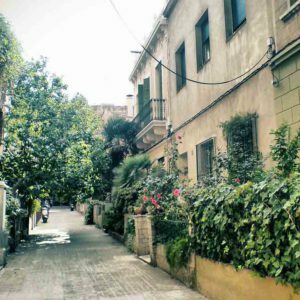 A secret hidden jewel in the Horta area. 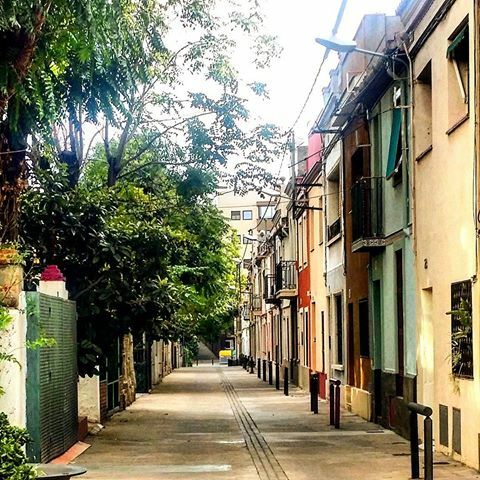 Far away from the bustle, in Aiguafreda street you can breathe peace, tranquility and beauty. 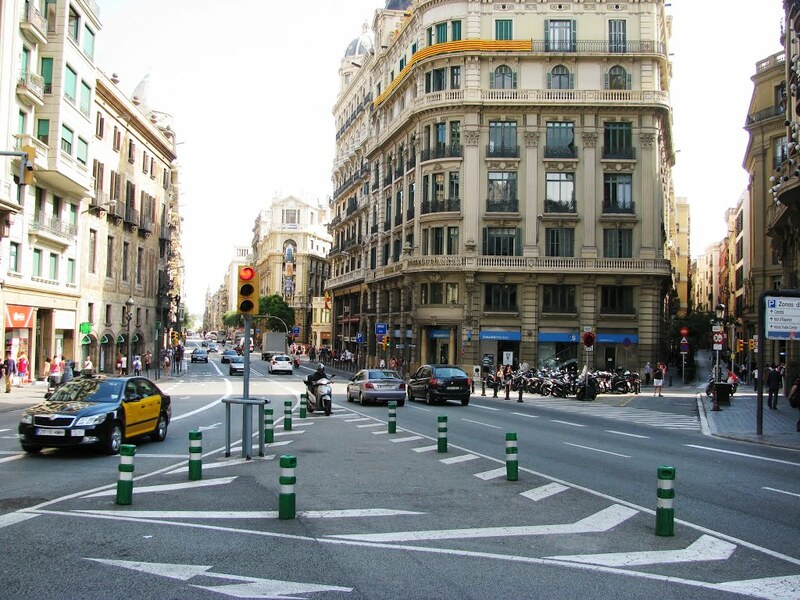 Even children can play on the street. 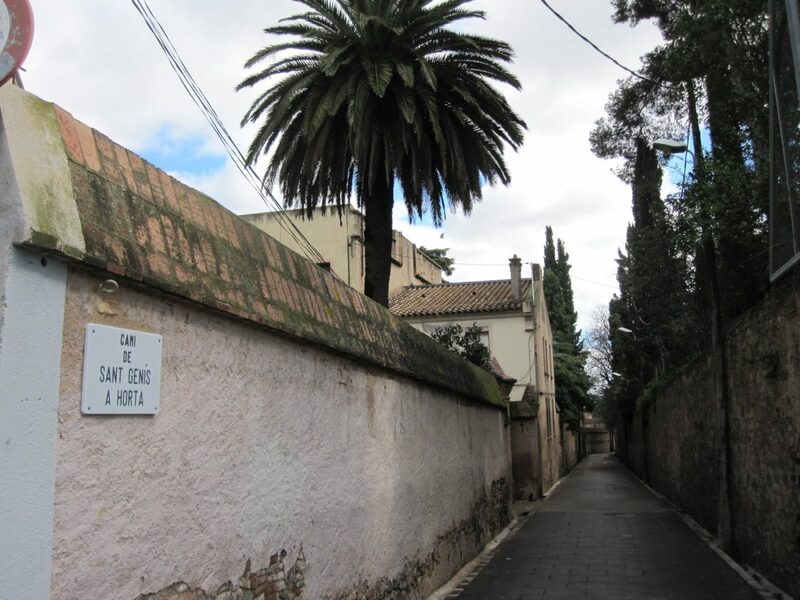 You can still see the wells and the places that the laundresses of Horta used for almost two centuries, from the 18th to the beginning of the 20th. 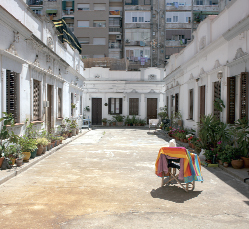 If you want to go back to the past in your next audiovisual production, this is the ideal location to do it. 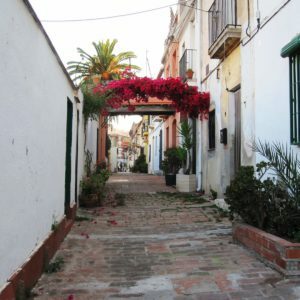 Aiguafreda street is a small pedestrian street with no more than 32 houses, almost all of which have a clean water well and a laundry room in front of them. 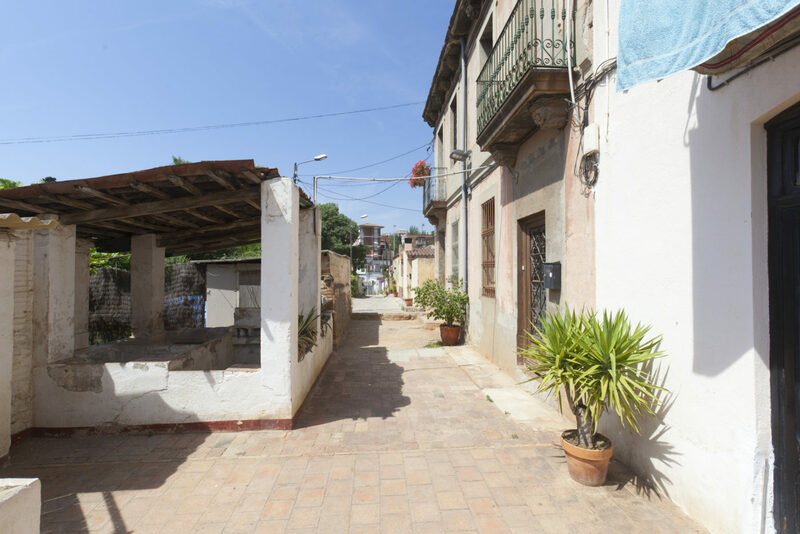 Aiguafreda is the road that best maintains the essence of the old quarter of Horta. 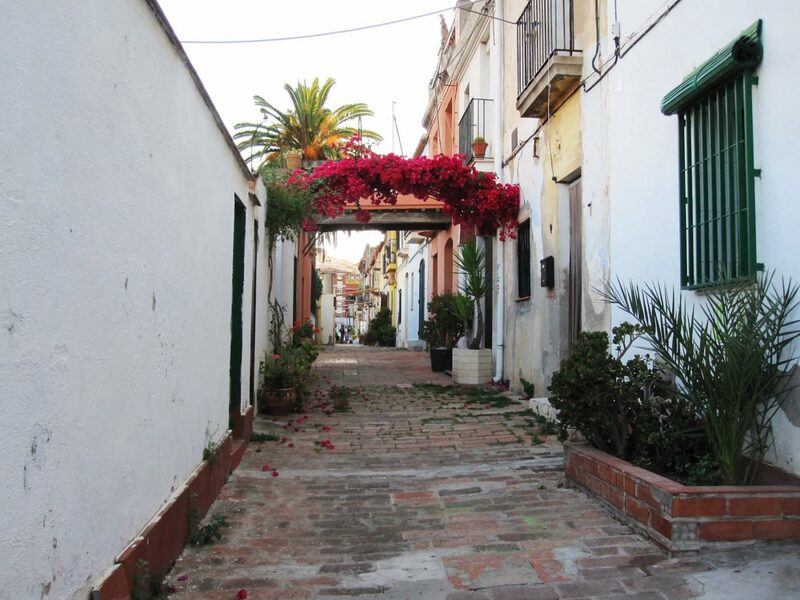 Along it, the tiles or paving stones change almost in front of each house. In the heart of the Sant Andreu district, between the streets of Agustí Milà and Gran de Sant Andreu, you can also take a trip to the past. 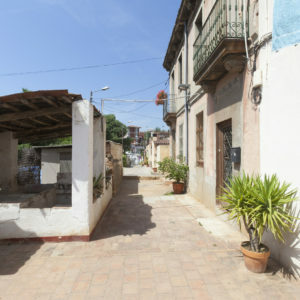 The street of Grau, in the shape of an L, follows an urban model typical of the old quarters of the Maresme villages, and is one of the few of its kind left in Barcelona. 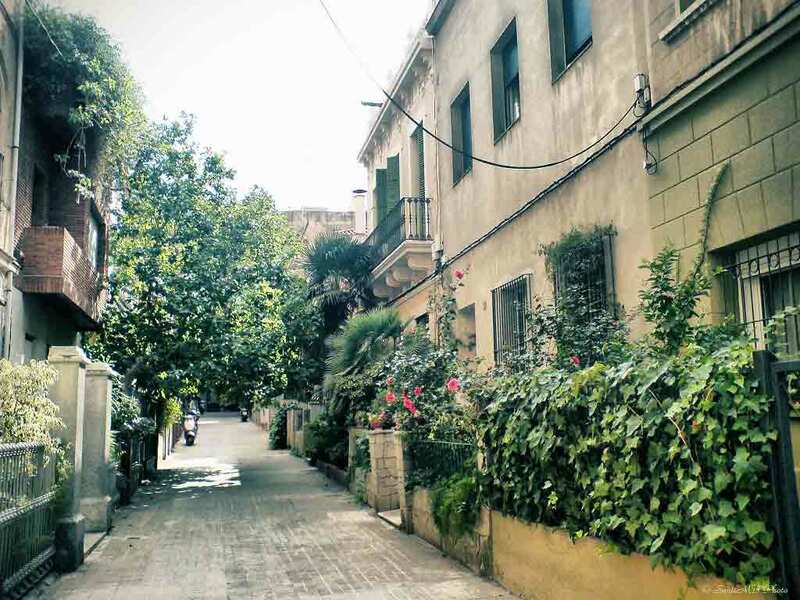 One of the sides is flanked by a row of single-family houses, some listed and protected as historical heritage, and the other, by gardens and potagers. 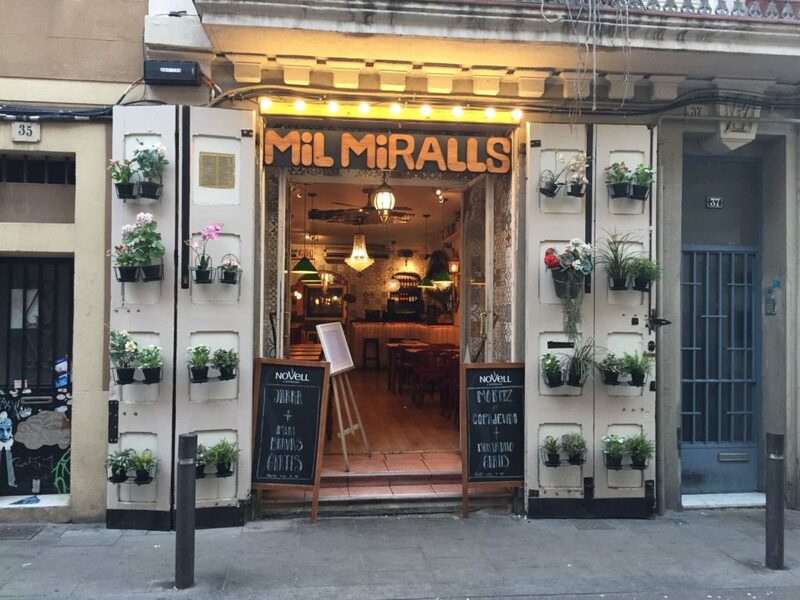 An authentic attraction to locate your next audiovisual project. 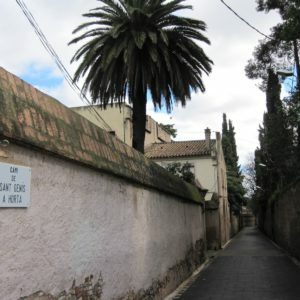 This road joined the town of Horta, passing through the Clota to the church of Sant Genís dels Agudells, at the foot of Collserola. 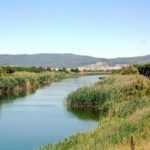 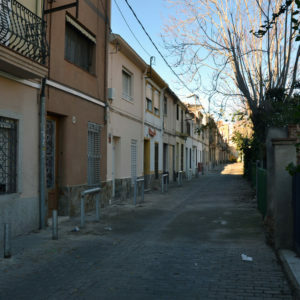 The section that goes from Clota to Cardenal Vidal i Barraquer avenue and another section that continues up to Martí Codolar avenue, with all its old and rural air, is still well preserved. 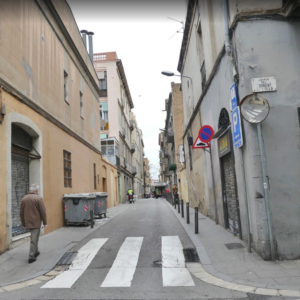 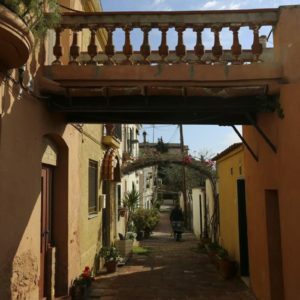 It is hidden behind the street of Rossend Nobas, next to the busy Mercado del Clot. 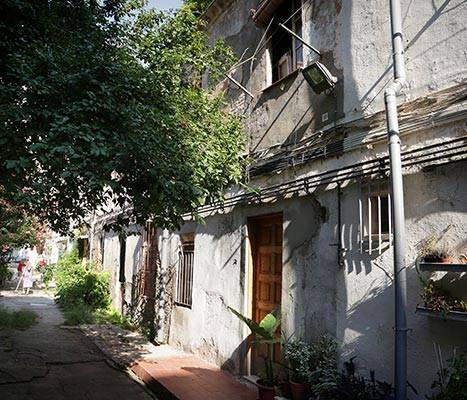 Formed by a row of low houses and with no tiled floor, it has remained intact over the years, as an evidence of the neighbourhood’s rural past. 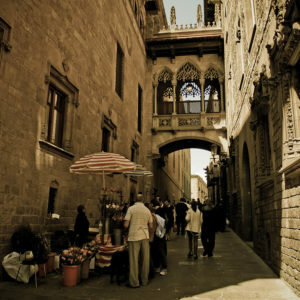 An ideal location to return years back in time within the city of Barcelona in your photographic shooting. 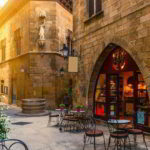 It was the main street of Barcino, the Barcelona of Roman times. 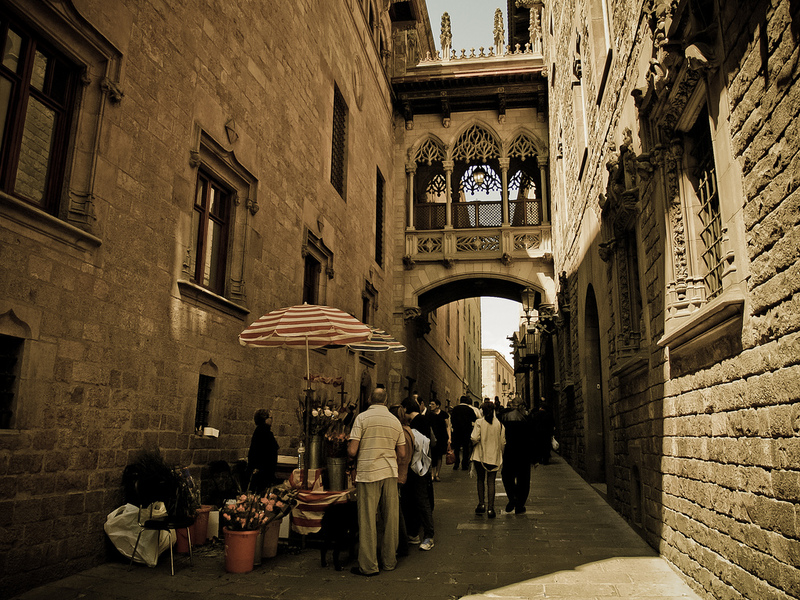 The Pont del Bisbe is one of the most sought after by the cameras of curious tourists. 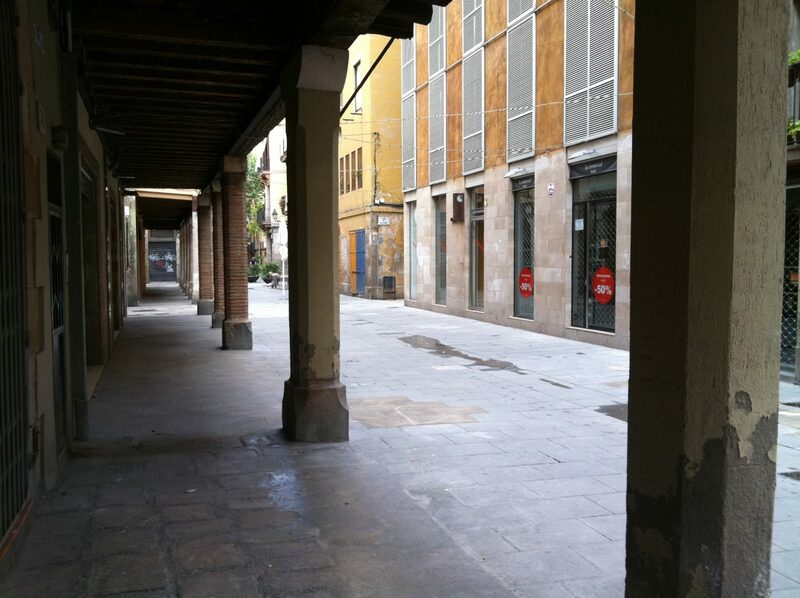 Carrer del Rec circulated the waters of the last section of the old medieval aqueduct of the city. 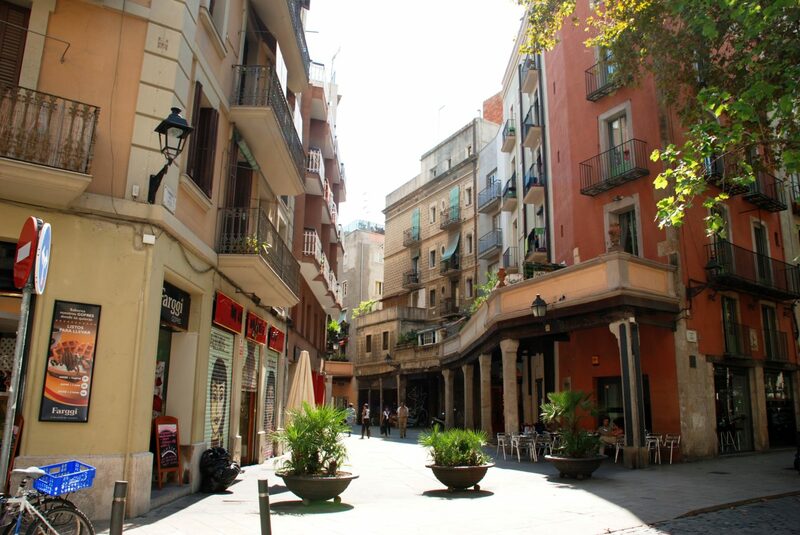 This curving street is now a charming corner thanks to its arcades and balconies. 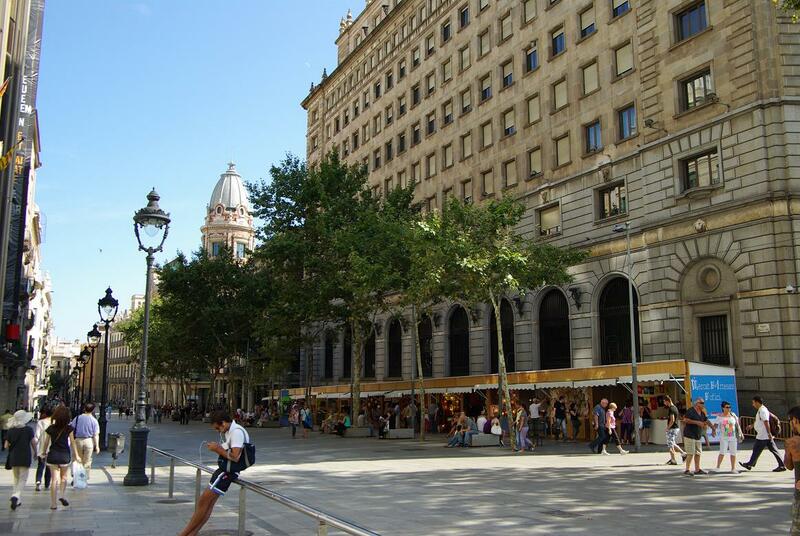 There are shops, restaurants and modern cosmopolitan bars. 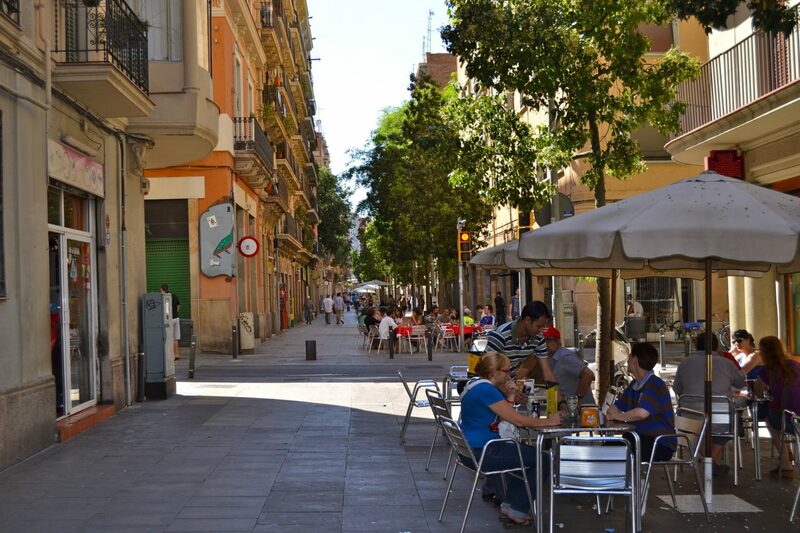 In addition, because of its orientation, it is an ideal street to spend some time in the summer on your way to the center of El Born, since it is almost without direct sunlight and remains a cool place. 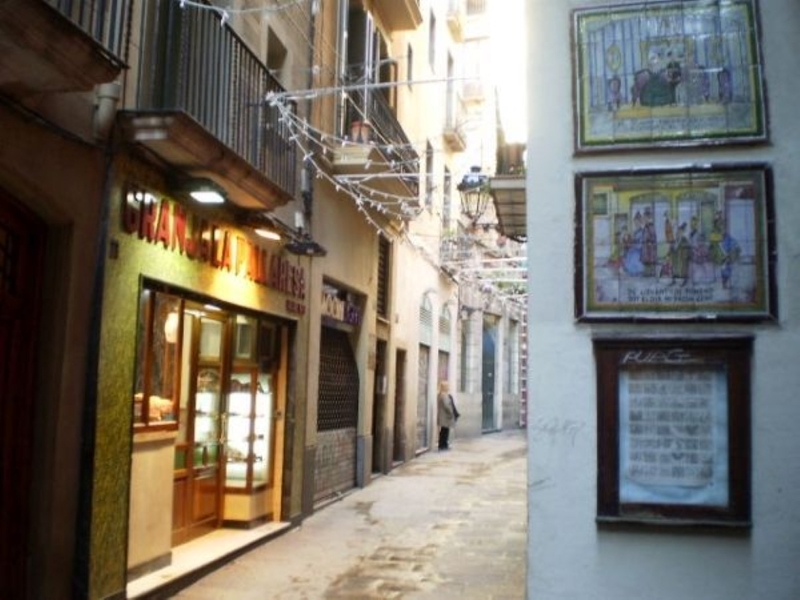 One of the streets adjoining La Rambla is Calle Tallers. 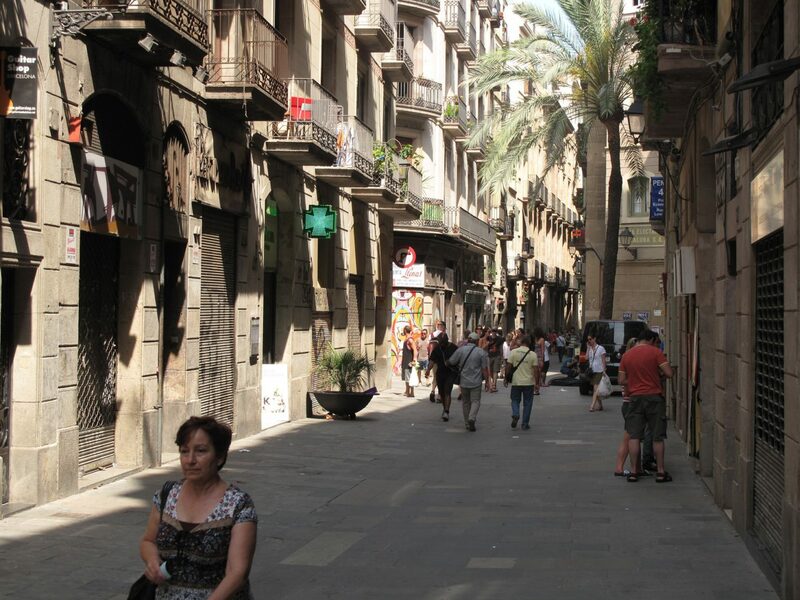 Along 500 meters to Plaça Universitat we find a narrow and pedestrian street full of alternative shops of all kinds. 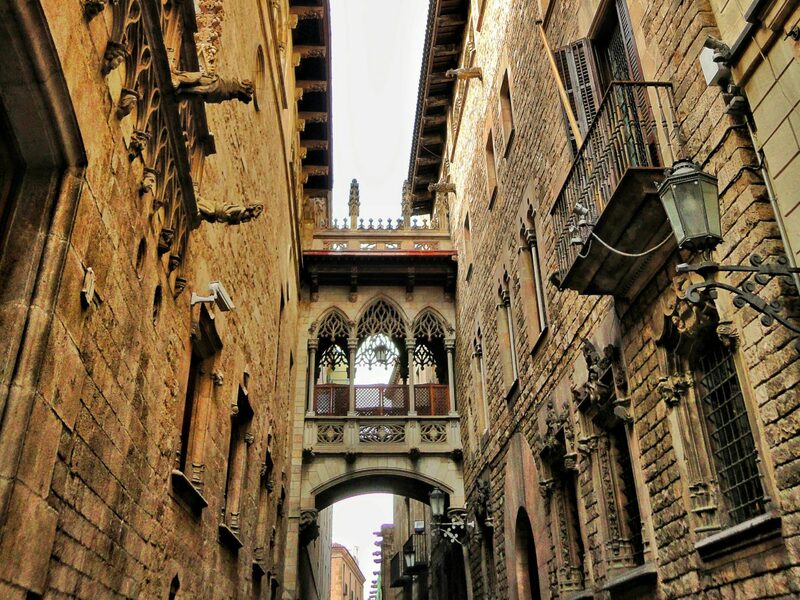 It is more than 700 years old and has still an old medieval charm. 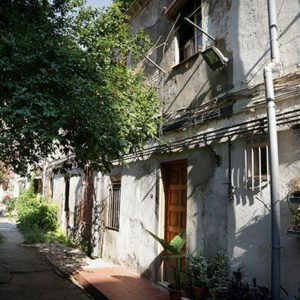 Its atmosphere is between punk, vintage and gothic. 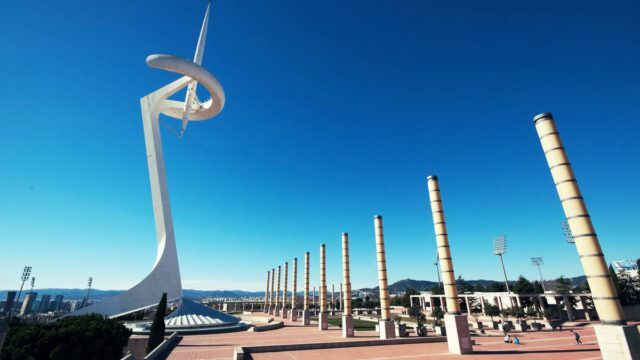 Is this what you’re looking for for your next audiovisual production or photo shooting? 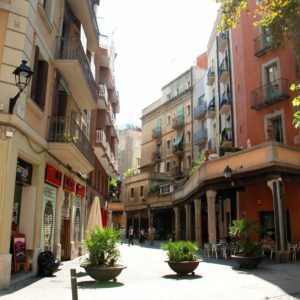 With just 129 metres long and three wide, the street of Petritxol is one of the most unique in the Gothic quarter, it is parallel to the Ramblas and joins the Portaferrissa street with the Plaza del Pi. 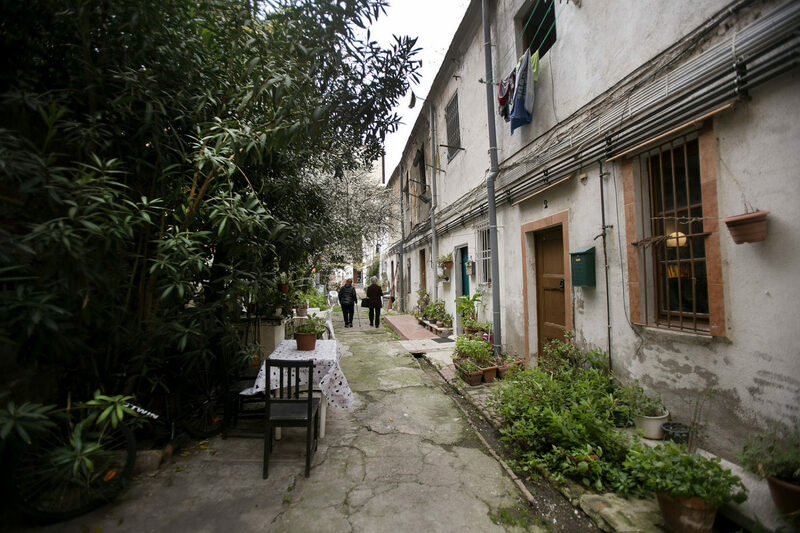 Its most characteristic features are the ceramic inscriptions on its walls that tell stories of the neighborhood. 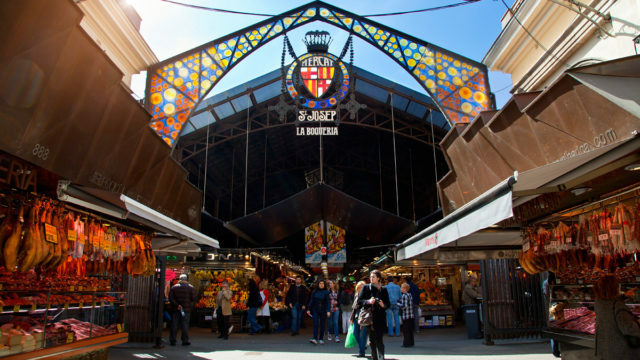 In its short route there are more than 30 establishments, among them the chocolate shops stand out. 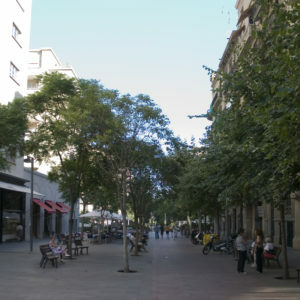 Diagonal Avenue is one of the longest in the city, approximately 11 kilometers. 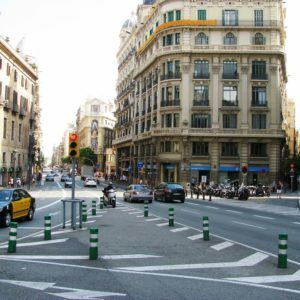 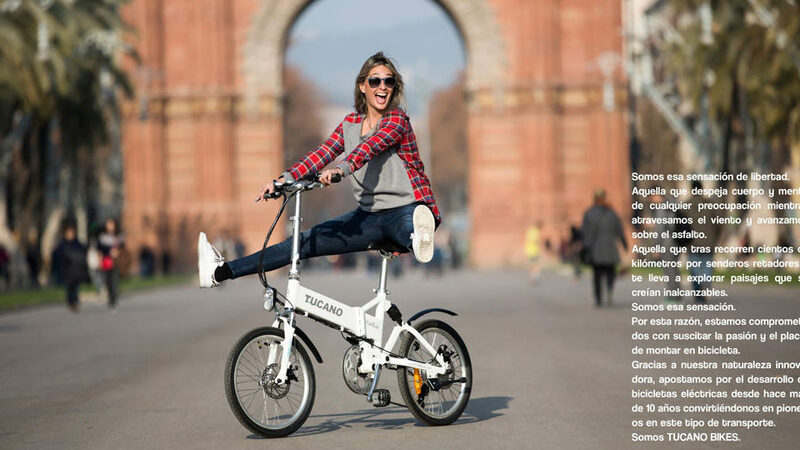 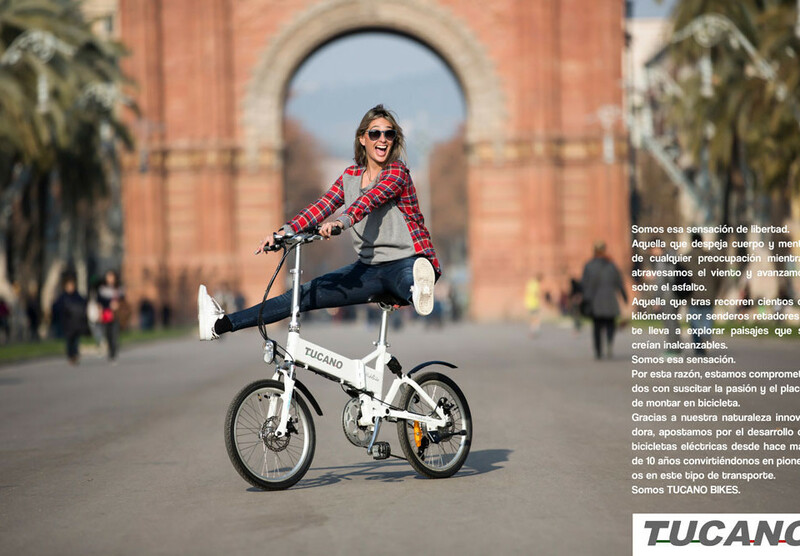 It was designed by the engineer Ildefons Cerdà, who devised the great project of renovation of the city. 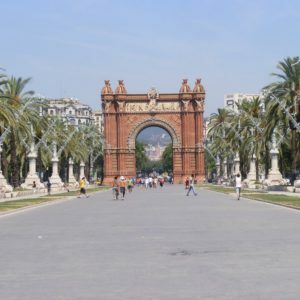 It receives its name because it divides the city from west to east in two. 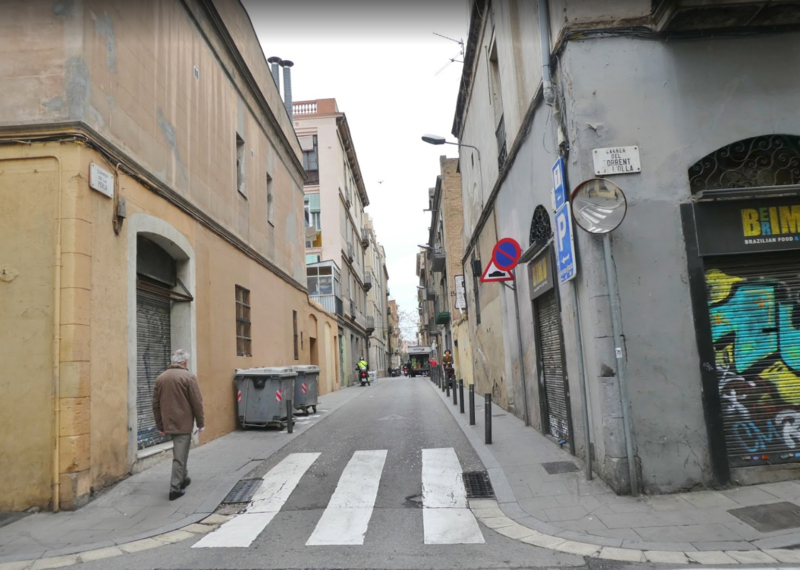 Along this avenue we can find historic buildings, shops, restaurants, businesses, literally everything you need for your next audiovisual project. 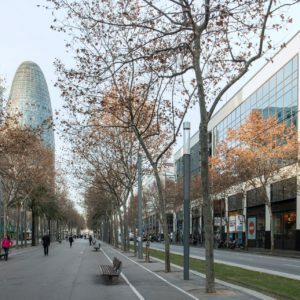 This avenue is famous because it joins two architectural gems of the city, the Sagrada Familia and the Hospital de Sant Pau, two perfect examples of Catalan modernism. 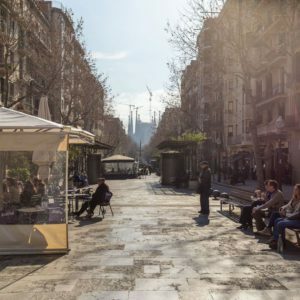 The design of its modernist style lights with gothic airs in conjunction with its benches, bollards and terraces of the street bars. 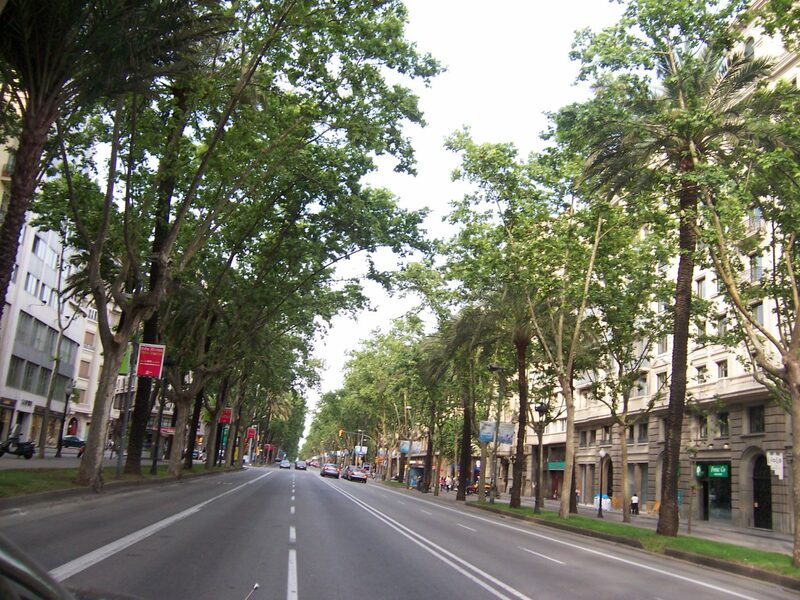 It has a spacious central stretch of sidewalk that makes it an avenue that is worth walking. 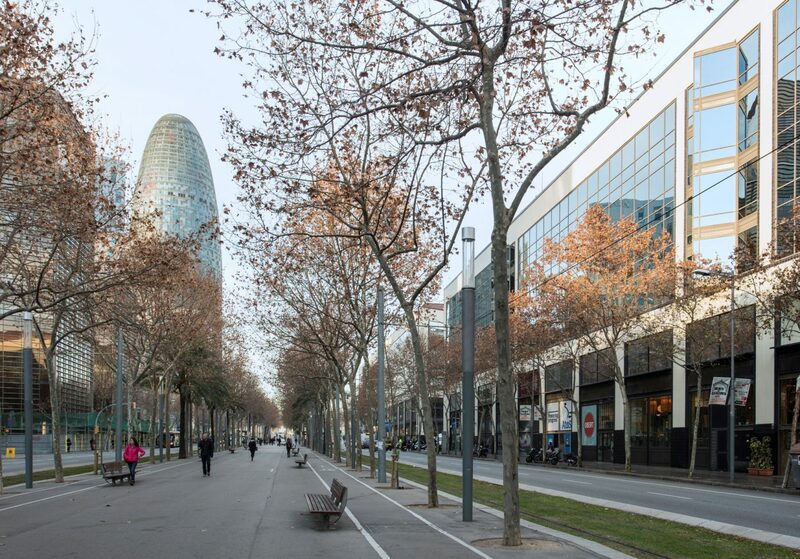 Although the lower part is more visited by tourists, this avenue is full of neighbourhood shops and small restaurants of very different kinds, with these two modernist monuments as a backdrop. 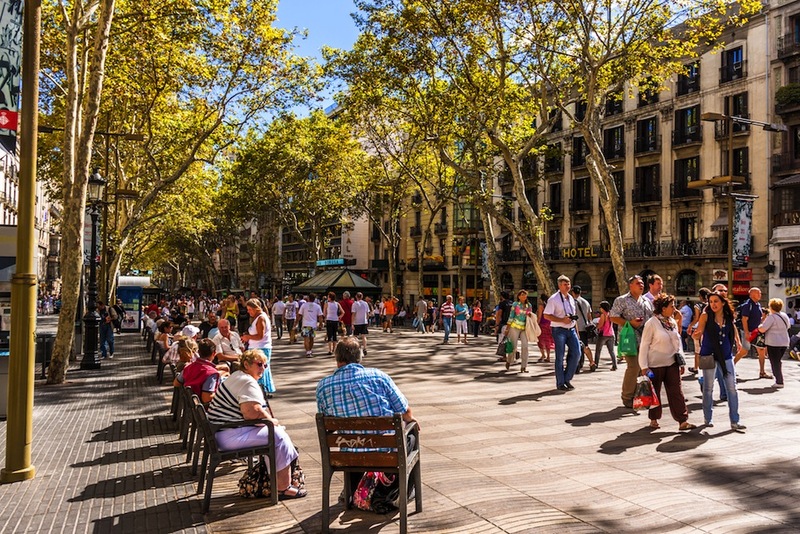 It is one of the most multifunctional spaces of the city, with busy people walking on their way to work or to the university, grandparents on their morning walk, groups of children on a field trip, tourists taking photos with the background bow and many other colorful characters of all caliber. 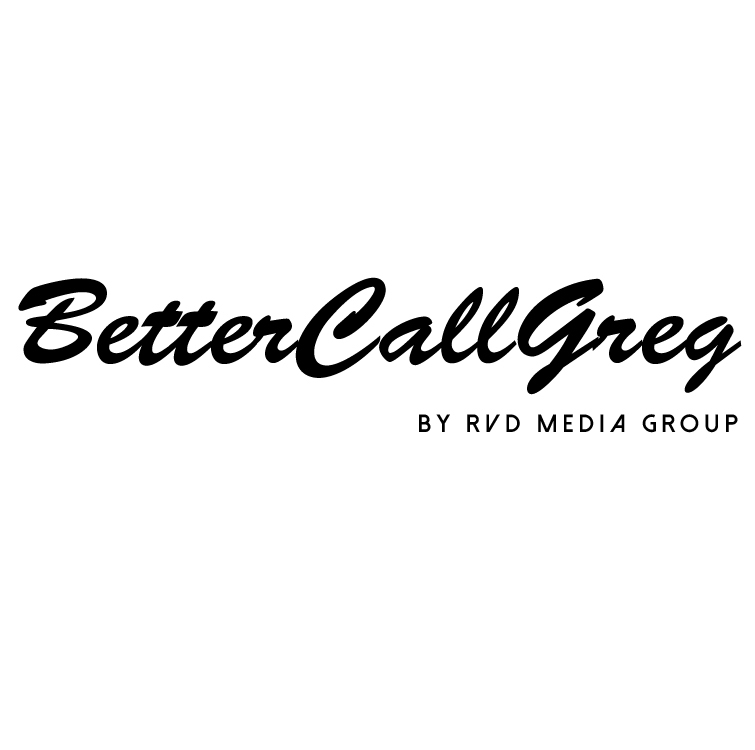 The RVD Media Group team has already used this location for some of their audiovisual projects that you can see in their portfolio. 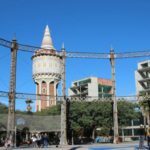 One of the most surprising, strange and unknown spaces in Barcelona. 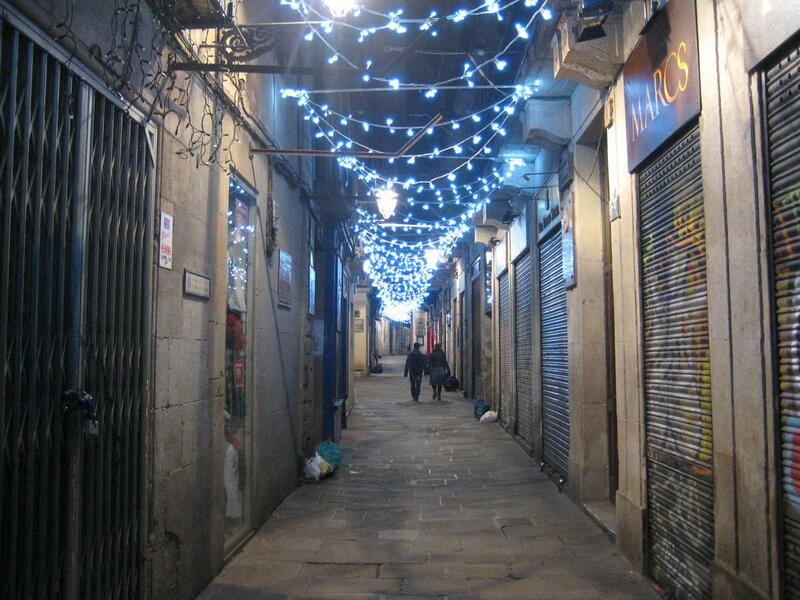 It is a small passage that is accessible by passing the staircase of number 29 Rocafort street. 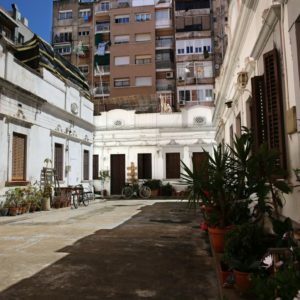 It consists of 11 white houses, built in a kind of interior passage, without a name, and it does not appear in any plan or guide. 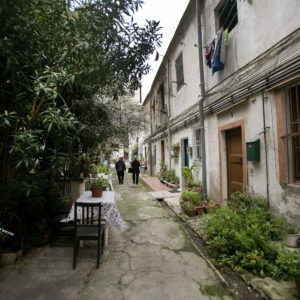 It is formed by two alleys full of plants plant there by the neighbors. 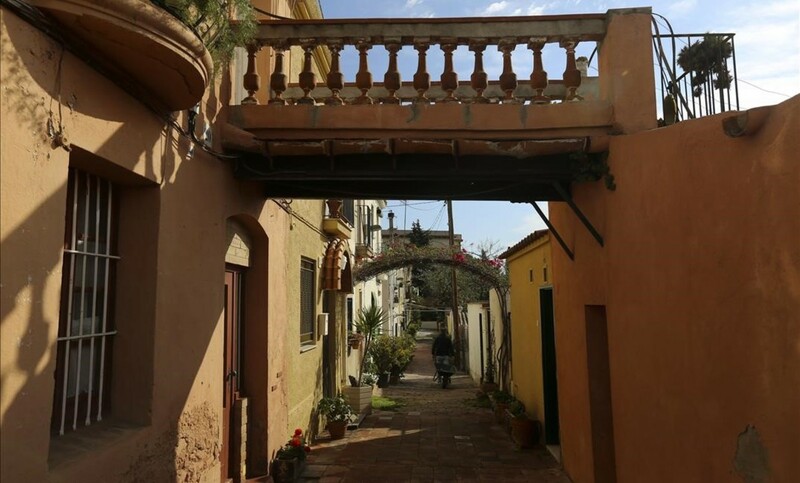 The houses are small with a covered patio at the back and stairs to the roof. 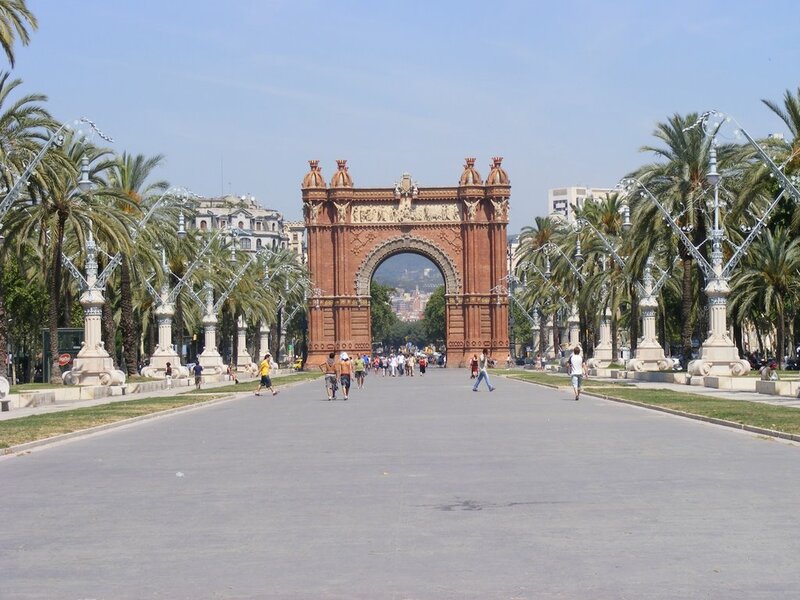 They were built in 1924 probably for the workers of the International Exhibition of the year 1929 in Barcelona. 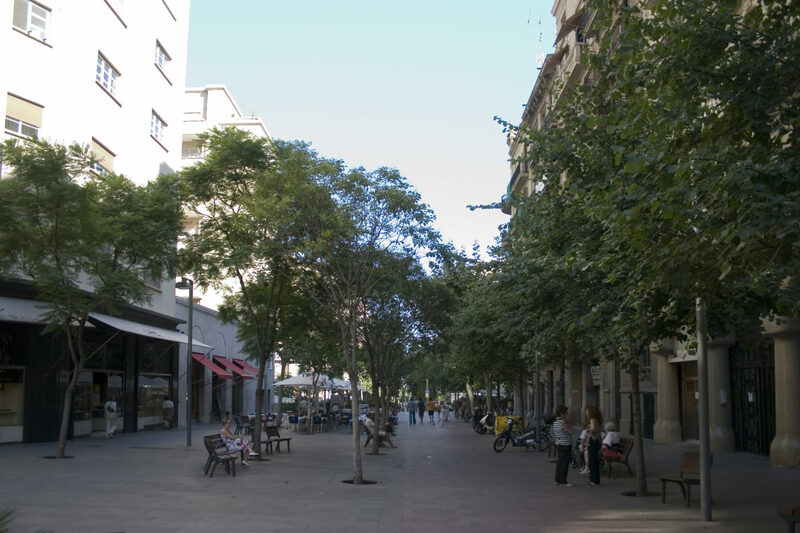 If you go from the upper part of the city to the centre it is nice to walk along this street which, despite being a circulating street, is almost a pedestrian promenade. 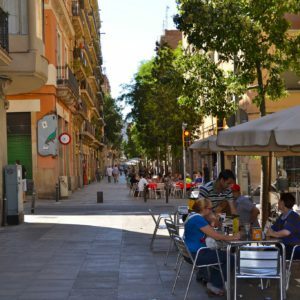 It is full of restaurants and bars with pretty quiet terraces. 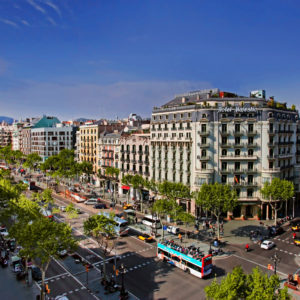 The best areas are the two extremes, which are pedestrianized, and in the same street you will find also flower shops, shops for design furniture, clothing, decorative objects, art galleries, ice cream shops … It is by far the most cosmopolitan street and an environment of the most chic for your next audiovisual production or photographic shooting! 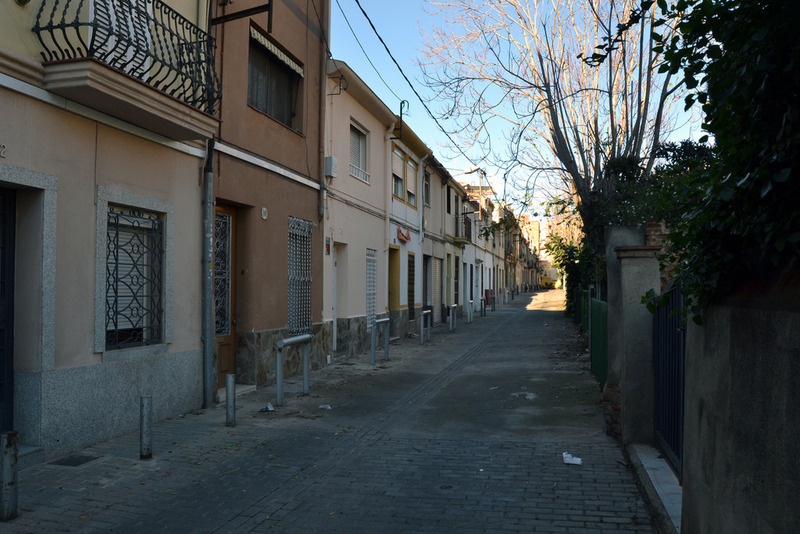 A road in the lower part of the Putxet neighbourhood, which started with a score of houses with some modernist towers along with other modern houses. 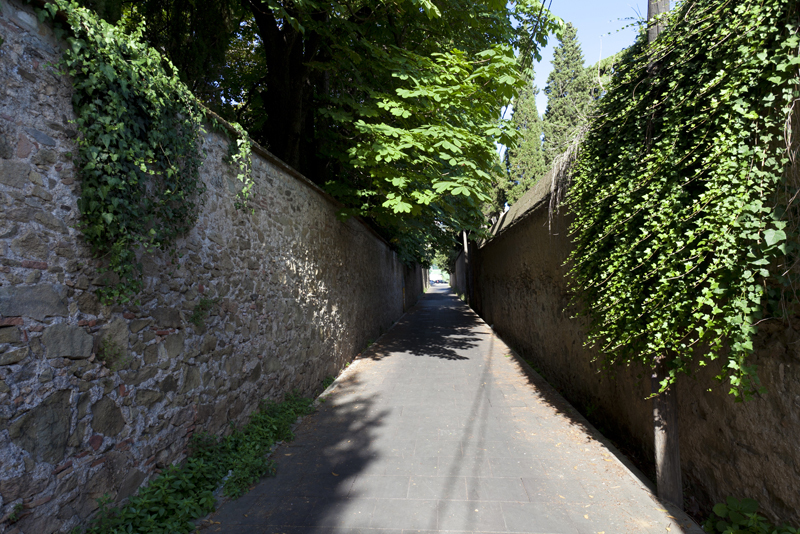 It is, without doubt, one of the most interesting passages of the city. 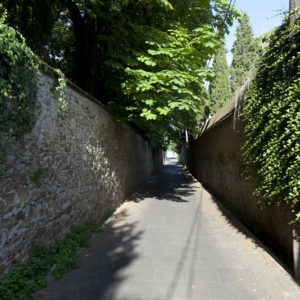 If you want to know the atmosphere of the Grace area, take this street. 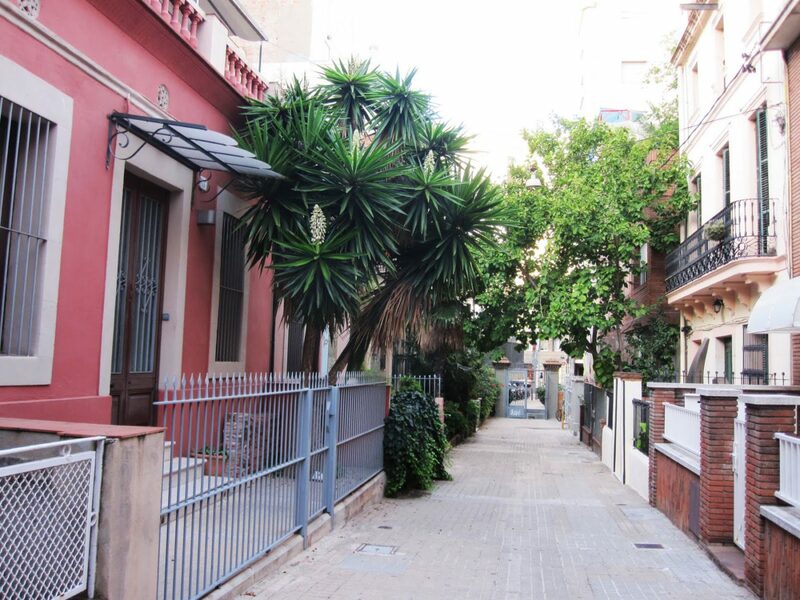 It is a great example of the residential area of ​​Vila de Gràcia, a quiet street, practically without cars, with very few buildings. 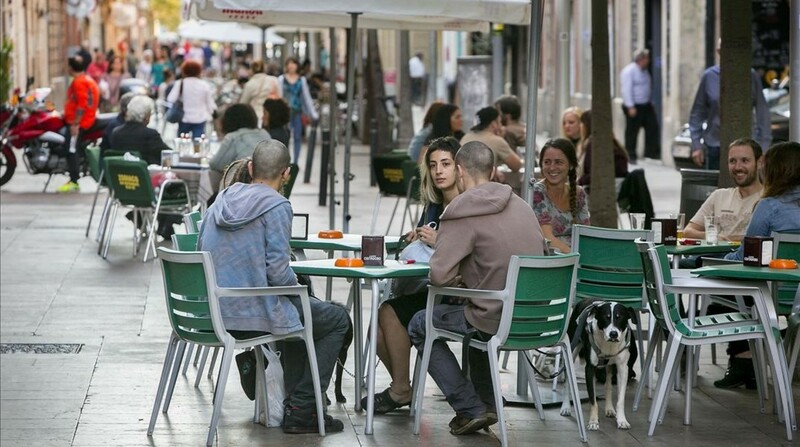 Most businesses are quiet shops and bars, places designed for neighbourhood life. 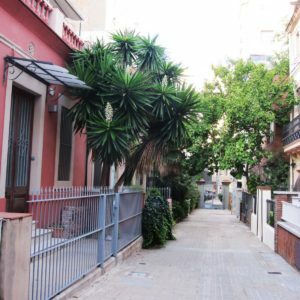 The essence of the neighbourhood in a single street, a location with a hipster and modern environment for the audiovisual project you have in mind. 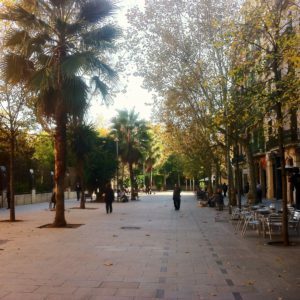 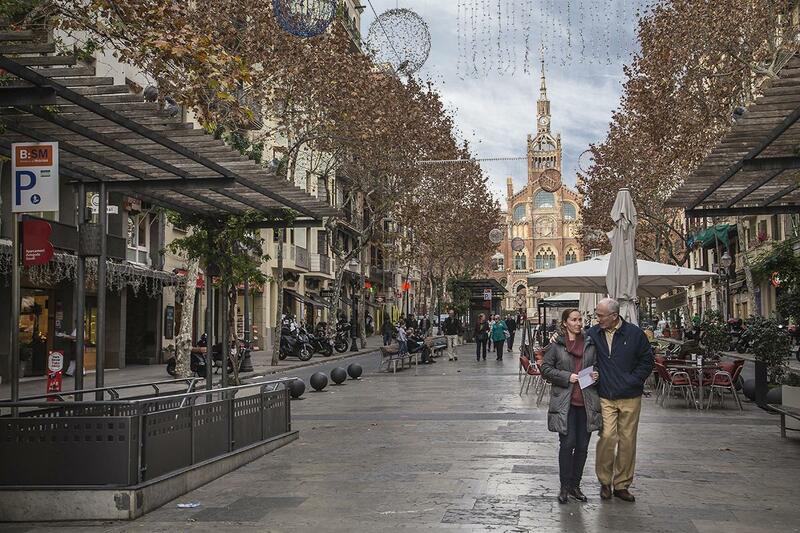 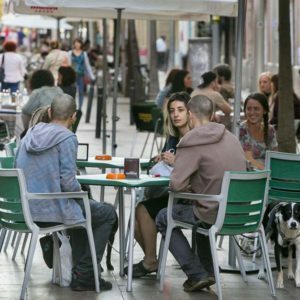 It is one of the neuralgic centres of Poble Sec, a pedestrian street that will allow you to get away from the centre and the Parallel. 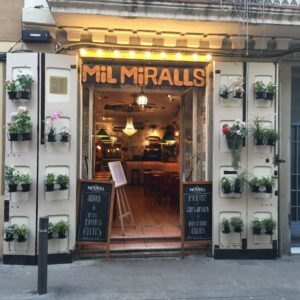 The whole street is full of restaurants and bars of all kinds, if you like pinchos this is your place.